The Columbia River is one of America’s largest rivers and one of the biggest sport fishing destinations on the continent. Five runs of salmon, two runs of steelhead, sturgeon, American Shad, walleye and small mouth bass call the Columbia River home. That’s a lot of fishing opportunity and hopefully this guide to the Columbia River will guide you to the fishing that you’re looking for. The Columbia River flows out of the Rocky Mountains in British Columbia, Canada and flows over 1000 miles to the Pacific Ocean near the towns of Astoria, Oregon and Ilwaco, Washington. The Columbia flows through deserts and lush forests, draining water from rivers and creeks as it moves towards the ocean. As large as the Columbia River is, most of the Salmon and steelhead fishing is done in the lower 300 miles from Idaho to the mouth, with the biggest concentration of fishermen from the mouth in Astoria to Bonneville Dam located about 40 miles East of Portland, Oregon. This is an incredible stretch of river and boasts huge runs for those looking to fish it’s famous waters. There are certainly a variety of ways to break down the Columbia River, but for most of you looking for a guided fishing trip, time of year and location are the big variables so let’s get to it. Astoria, Oregon is located where the Columbia River meets the Pacific Ocean. For good reason, Astoria is famous as a sport fishing town as there is no shortage of opportunity about seven months out of the year. In addition to the Salmon, steelhead and sturgeon fishing that the area is famous for, there is also plenty of history to explore in Astoria, great resturaunts, nice lodging and plenty of things to do while visiting the area. If you’re interested in fishing the Columbia River near Astoria, you’ll want to visit our Astoria Fishing Guide page for more details. Portland, Oregon is located on the shores of the Columbia River about 90 miles from the mouth. Portland is unique as a large metro area, to boast abundant Salmon runs, sturgeon fishing opportunities and steelhead fishing. Locals have it good with all the fishing opportunities in the area, but if you’re coming from out of the area, Portland may be one of the best Salmon, Steelhead and Sturgeon fishing destinations in the world. Much of the fishing on the Columbia River is located within a half hour of Portland International Airport and all the amenities that a big city can offer. Bonneville Dam is the first of many dams that make up the hydroelectic system on the Columbia River. And while the hydro-electric system hasn’t been a good thing for migratory species, Bonneville Dam specifically has created one of the best tail-water fisheries in the world. The area below Bonneville Dam is one of the best areas on the Columbia River to fish for Salmon, sturgeon and steelhead. Located only 20 minutes from Portland International and 30 minutes from downtown Portland, this fishery is easily accessible for locals and anyone looking to visit the area. The area around Hood River and The Dalles provides anglers with a multitude of fishing opportunities. In this area rivers like the Little White Salmon or Drano Lake, the White Salmon, Klickitat River and Deschutes River all dump into the Columbia River. Because of this we are able to experience some of the best Salmon fishing on the Columbia River. Most of my time is spent in this area during the fall and with huge returns of Fall Chinook and very liberal limits, it’s hard to find better fishing anywhere. Known as the largest spawning area for Fall Chinook on the Columbia River, the Hanford Reach is a very special place for all of us that fish the Columbia River. The Hanford Reach is located above the Snake River and in close proximity to Kennewick, Pasco and Richland. 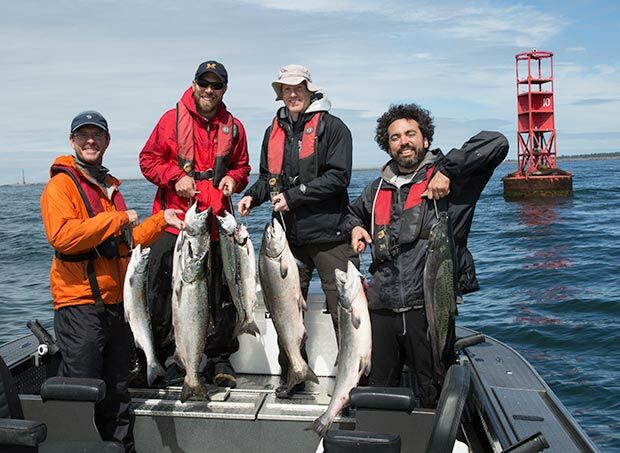 Are you looking to book a guided fishing trip on the Columbia River? Call 971.401.0521 or email info@lancefisherfishing.com.